A very short, stilted and dated science fiction story with a fascinating premise, featuring two women in the near future who haven given up their daughter to an experimental and dramatic fusion at the hands of benevolent and technologically advanced aliens. Warning: huge trigger warning for anyone sensitive about mentally disabled people. There were an entire novel's worth of issues raised that aren't really addressed, due to the shortness of the story. More of an interesting concept that needs expanding than a story in its own right. A Kate Delafield short story. Kate Delafield is the main character of Forrest's popular and award winning lesbian detective novels. This is one of the two longest stories in the book. In this story, she visits an old friend, a gay woman who returned to her small town to become the local sherriff, and enlists Kate in solving the mystery of her close friend and predecessor's murder. An interesting enough story, and a good introduction to the character of Kate, but the tension is ruined when the villain is both immediately obvious - and then goes into a several page monologue about who, what, where and when. But it picks up again, and the story is wrapped up neatly, with a bit of focus on Kate's personal life and character. Short horror. A particularly nasty young man goes home for a visit and accidentally kills someone, hiding in his special hidey hole he listens to his mother and her (female) lover talking to the police and remembers a bit of his childhood. Unfortunately for him, nobody manages to find where he's hiding. A disfigured and lonely man stationed on a quiet space station (EXXtel again) watches as a close minded protegee meets and rejects a beautiful, human-female bodied alien, and discovers a chance at intimacy for himself (no lesbian content, could be classified as gay or transgender). One of the better stories, this one drags you in and gets you to sympathise strongly with Joan (a lesbian in the closet), as she desperately tries to get rid of her blackmailing, adulterous husband. An alien woman is smuggled back to earth, only gives birth to daughters, and a stealth matriarchy begins (no lesbian content, but eventually all the men will be gone...). This is a prequel to the award winning Daughters of a Coral Dawn, and reads more like an introduction than a story. Another pretty good one, this is told in a markedly different voice - an abused, stubborn, frightened - and psychic - young woman telling her story, about how she was discovered to have an amazing musical gift, rescued from her abusive uncles, became incredibly famous, found love... and had it go terribly wrong when her gift exposed her to the audience and she lost her lover. A young woman wakes in a quiet room after a terrible attack across the world. The woman who is supervising her explains what happened (and lost her own lover of many years, adding a lesbian element), and explains the terrible choice in front of her. 9. O Captain, My Captain Read the full review of "Oh Captain, My Captain"
This story was amazing and the second 'proper' story. A long lived vampire works as a lonely spaceship captain, and has found an alternative source of nourishment. Erotica/ science fiction. Worth a review of it's own, and is also worth getting the whole book for. Also found in Daughters of Darkness: Lesbian Vampire Tales. A pair of parents push desperately to get their daughter tested for the homosexuality complex in a future that has discovered that all the creative and intelligent people possess this in their genes, and heterosexual people are a dying race. 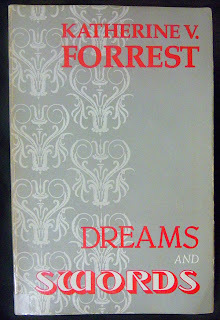 Dreams and Swords was originally published in 1987, and was reprinted in 2008. It can be ordered from Amazon.com but is not yet available as an eBook. The full review of "Oh Captain, My Captain"